Even though in most of Australia blueberries are a luxury treat, I will bring to your attention yet another study to show just how awesome they are. There has been some research that shows that plant polyphenols slow adipogensis and induse lipolysis (in other words, they slow down fat tissue creation and increase fat cell breakdown), so the researcher in this latest study described at Science Daily wanted to quantify this affect with blueberry polyphenols. 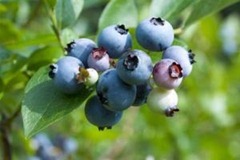 Another reason to snack on blueberries? WOW! Very helpful. I’m on my way to the market for blueberries now! Just stumbled onto your site, yay! Mine would not grow for the longest time. Then I found out my bore water was incredibly basic, and that the pH of the soil was around 8.5 to 9. Added some sulfur to the soil and it looks like I will be enjoying my first batch very soon! Raspberries are great too, however I am not game enough to grow blackberrys.